Thanks to everyone that entered our 4th Anniversary Competition. You may think we do these competitions to give ourselves a bit of a pat on the back when in reality that is very far from the truth. It is actually to gather feedback on what users love and use in X-Plane. There is no bigger waste of time than reviewing or focusing on items that users basically have no interest in, we want to give you information of what affects you as a user so you know and can use your aircraft, airports, plugins to the best in X-Plane. So two aircraft stood out. The JARDesign Airbuses and VskyLab's DC3/C47. The JARDesign Airbus will soon be joined with the release of FlightFactor's A320 and so that will be a significant observation between the most popular Airbus in X-Plane with the newcomer, no actual release date is forthcoming but soon would pass the developers lips at this moment. My flying month of August was dominated by two aircraft, one the above mentioned VskyLab's DC3/C47 and the second the Zibo MOD Boeing 737-800. First the DC3. There is an update review coming for the just released v2.1 of the DC3, but everything has been on hold for the week because "yes" I have had another (four this year!) flu bout this last week and that has absolutely ruined all the plans. So sorry the site has been slow. So back to the gut buster. VskyLabs released their DC3/C47 around late July 2017, in fact only weeks ago. First impressions were impressive, but in areas it was a little bland and hence the low price. Biggest visual negative point as there was no mapping or that raised riveting and lines set out on the bodywork. Personally at that point in the review I thought that X-Plane users deserved a little better than this and with this iconic aircraft at that, but I liked it, so don't get me wrong here. We will note the Leading Edge DC3 version, but that is a very old version now, and again X-Plane users deserve better. In most cases after a release the developer will disappear for about six months and then pop up again with an update unless there is something urgent to correct with the release version, but that is not what happened with the VskyLabs DC3, in only weeks there has been a significant upgrade to the aircraft in version v2.1 including the noted mapping, so full and absolute credit to the developer, and I will cover those updates in the review. But the aircraft was also very significant. I did the review and moved on to another release, but in my spare time had a few flights including getting lost over the North Sea (It was a long story) but I flew from Aerosoft's ENBR - Bergen but ended up in EGPH - Edinburgh (I said it was a long story), but along the way I totally fell in love with the old bird. The aircraft brought back the reason we all do this flying thing, sheer fun and delight. To get the full effect you do need rk Apps XPRealistic Pro excellent realism shaker and a lot of time as the DC3 is not the fastest aircraft on the runway, but that is the whole point as well. You don't fly in the DC3 but trundle, shake and grin a lot. I can see why the aircraft is so beloved by everyone. So yes I am addicted to the DC3 like it seems is now everyone else, an amazing aircraft and the current version is simply outstanding, not perfect as it is still a project in progress, If you don't have it then you are outside the class and you need to get with everyone who has, it is becoming an amazing aircraft. Another aircraft that has dominated my flying time has been the Zibo MOD Boeing 738 which is based on the X-Plane Laminar Research default Boeing 738. This is an interesting development in X-Plane as most X-Plane default aircraft are mostly off limits to changes, but this ZIBO version may change that area significantly. In most cases the developer is the owner of the copyright, so unless with permission outsiders can't mess with it, and in reality you shouldn't because it will mess up the basic fundamentals of their systems and settings. It is fine to do liveries or an external modification (MOD) but on the aircraft stuff then that is a no, no. But there are a few items that do need attention in this area. Some aircraft are allowed transfer copyright wise as they are leaving the game or in most cases usually have sadly passed off our mortal coil. But what of developers just leaving us all in the lurch like Virtavia and Dawson Designs and their C-17 and SeaKing aircraft? Mostly they just need a few touchups to keep them X-Plane11 happy, but there is nothing we can do? I totally love the Seaking but the glass doesn't work in X-Plane11 as it is blacked/blanked out and Virtavia is saying nothing, is that good enough... no not really. But the default Boeing 738 is a very different deal. Laminar Research commissions developers to create aircraft (and scenery) for the simulator. Mostly they are externally very good, but system wise very basic. They usually only have updates only when absolutely required like with a new feature or version of X-Plane, noted is the fact they are really quite good with X-Plane11, but overall they are still basic. So along comes the Zibo MOD Boeing 738, which takes this basic model (with permission I would think) and changes most of the systems and adds in a lot a great features, and this project has become THE really big attention-getter in X-Plane this year. Modifications (MOD) can be one of the great areas of X-Plane, but it can send you down dead end paths that experienced developers do avoid. I mostly stay away from MOD's unless there is an outcome worth noting, so yes my involvement with the Zibo MOD B738 has been fleeting, but I have kept an eye on it if only from a distance. But there was also the time I needed to see where it really was in development and see what all the fuss is about. So I deep dived and loaded in all the elements noted like the base MOD, Terrain Radar (works with other aircraft as well! ), AUDIOBIRD sounds and mashed them altogether to create a B738 that is quite frankly amazing, but not perfect. A test flight from YBBN - Brisbane to WADD - Bali shows that the Terrain Radar and the sound pack are excellent, and the basic flight systems are very good as well, but the FMC is still very buggy with SID - STAR insertion and editing not very good at all, but then again it is another project in progression and FMC's are the hardest areas to develop as even the best have struggled with making them efficient. When the project is more polished I will of course do a review or cover the aircraft because of its significance to X-Plane, I just don't think is is still quite there yet. But it is a significant project and an interesting one? So do Laminar take all the mods on board and add them into the default version? That is an interesting question because it would quickly elevate the X-Plane default aircraft from good to very good , my personal take is that if the original developer says yes (or authorises) the changes then all I see a big beneficial to the simulator as a whole, but problem is the MODs are out of the developers designs so what if he want to update and update, you can see how it gets complicated? Certainly in time most default aircraft will get the same MOD treatment and for that then everyone benefits. But it is feeling like there is change around with this MOD business and the success of the Zibo MOD B738. Don't get me wrong we don't need a load of conflicting MOD's on the same aircraft, but it is a very interesting development this year. Another huge area now also emerging is the new FMOD sound engine built into X-Plane11. Now as the developers have started to get their heads around it, very quickly the updates to FMOD sounds are now coming thick and fast, again an easy and very brilliant advance to an area neglected for far to long in great sound. And like with the above Zibo MOD B738 the sound package from Audiobird was to just an add on FMOD pack that you just dropped in to the aircraft file and that quickly and totally changed the aural aspect, can it be just that easy? Well yes and it works, so you are going to see a lot more of that in the future, brilliant sounds at just a click and drop. 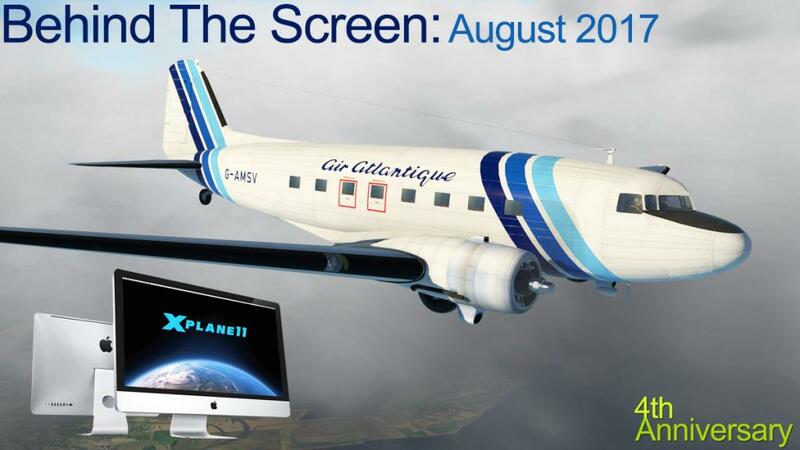 September is shaping up as a brilliant month as two projects that have been in extended development has been xEnviro and WorldTraffic3 (WT3) which are both finally coming into their end games. xEnviro weather engine in v1.07 has had a few issues along the way, but finally the developers have noted that it is now in beta. There are a ton of new features and the dreaded disconnect server issue has also been addressed, if history (recording and using past weather history) is not going to in there and there has been no mention of a Mac version either, which I think is a major issue and should be a priority and not a new feature. From an income angle alone it doesn't make sense, but then a lot of what these guys have done over the last few months doesn't make much sense either. WorldTraffic3 is also in the last throes of beta testing. I have noted before that WT3 was coming soon, but this is one complicated plugin, and it is amazing how something has to be so complicated to make the user interface far more easier and accessible to use. Clean out the old desk and usher in the new... WT3 will blow you away with its ease of use and the sheer dynamics it will bring to your simulation flying, plus it is the very best animated computer screensaver and timewaster ever! As noted earlier the FlightFactor A320 is still in development, but there is as noted is a bigger sniff in the air that it could be coming in September as well, if not then early October, but this is one project you don't bet on as the development period has been long and detailed. So September is going to be an interesting month and we will see how it all rolls out. Certainly 2017 has already been a huge year for X-Plane, but my guess it is all going to end with a lot of great developments and brilliant releases rather than whimper out, its been a great ride till now, but as they say "You haven't seen anything yet"... see you all next month.